We can provide vintage tea sets in your choice of colors (subject to availability) or choose a mix of vintage colors and patterns. You may already have pieces you wish to use and just require extra items or a few special pieces, or you may need everything! Most people prefer to hire just the items they need, but we are happy to provide a full vintage high tea package if preferred. We can provide everything you need to host a vintage high tea, including teapots, cups, saucers, tea plates, tea cutlery, tea strainers, vases, tiered cake stands, tablecloths, napkins and serving pieces. Our service is entirely bespoke and we are always happy to provide your color preferences or theme, subject to existing commitments. Due to the amount of vintage china, silver ware, cutlery, crystal and linens we have available, we cannot accommodate individual selection by the hirer. Please email us at info@thevintagetable.com.au with your requirements, an event date and location and a contact address. A custom quote will be prepared and emailed to you for review, along with terms and conditions of hire. BOOKINGS: A 50% deposit is required to secure the booking and the items chosen. Final numbers are to be advised 7 days prior to the function and the balance is payable 7 days before the event. Deposits are refundable, less a $50 fee up to 7 days prior to the event. Cancellations with less than 7 days notice will forfeit deposits. DELIVERY: The Vintage Table offers delivery/pickup services throughout the Perth Metro area. Delivery within the city is $70. Alternatively, you are most welcome to pick up and drop off at our Applecross premises at an arranged time, at no cost. HIRE PERIOD: Hirings are for a three night period at no extra cost, to allow plenty of time for setup and styling and for dismantle at the end of the event. Clients are most welcome to have their orders on the Friday and return on the Monday, or the day prior to the event and return the day after if a mid-week function. PRIVATE VIEWINGS: We work from a home based studio in Applecross, but are more than happy to arrange private viewings for wedding and Luxury Traditional high tea hire. As many of our items are out on hire most weekends, viewings are only available mid-week by appointment. 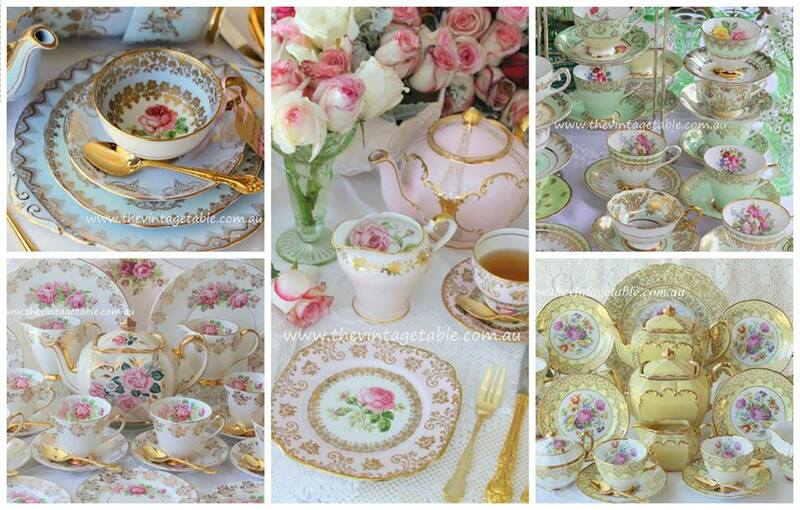 MINIMUM HIRE: No minimum for vintage china and high tea hire, minimum hire is $100 for cake stands and styling hire. HIGH TEA COLOR CHOICE: We can provide vintage tea sets in your choice of colors, subject to availability. We have all-pinks, baby blues, minty greens, lemon yellow, white backgrounds, oodles of florals in all colors and a smaller collection of blacks and richer, darker colors. SET UP AND STYLING. We can provide a full setup and styling service for large high tea events, corporate events and weddings. Contact us to discuss your requirements. DAMAGES: Hirers are responsible for any damages incurred whilst the items are in the possession of the hirer or their agent. A security bond of $200 is required for all orders, however for larger and regional orders, the bond is 50% of the total order. The security bond is returned in full during the week after the event if no replacements are necessary. Breakages and loss are charged at current replacement cost per item. Replacement costs will either be deducted from the security bond or invoiced separately. Payment of deposit indicates your acceptance of these terms. WASHING UP: We are happy to have our china returned unwashed, however we are more than happy for you to do so. All items must be washed by hand and should never be washed in an automatic dishwasher. Harsh chemicals and very high temperatures will damage antique china and silverware. We do not charge a washing up fee for orders under $500, however for orders over $500 a washing up fee will apply if you prefer to return them unwashed. REGIONAL FUNCTIONS: We welcome enquiries for events outside of the Perth metro area. Due to insurance reasons, we can only hire to professional wedding planners, stylists and event planners for regional weddings and events. STYLED SHOOTS: We love styled shoots and working with like minded vendors and creatives. Send us your ideas and let’s see what we have to fit the brief. GENERAL: We cannot accept bookings for children’s parties due to the fragile nature of our vintage fine bone china. DIY WEDDING HIRE: Please contact us to discuss your event. DIY hire is not available for regional events and can only be hired to professional, fully insured, event planners and wedding stylists on behalf of their clients. VINTAGE CHINA SALES AND ORIGINAL PHOTOGRAPHS: Our vintage tableware is not for sale and is only available to hire. We do occasionally sell excess stock via local selling forums and do not post. All our images are original and we do not use ‘inspiration’ pictures from Pinterest etc. A selection of our original photographs can be purchased from Shutterstock and Getty Images for commercial use. Another hugely successful event and the tables looked absolutely stunning with your vintage tableware. Thank you so much once again!